It opened on Monday 3 December 1906. The first performance at HMT Aberdeen was the pantomime Red Riding Hood. The A-listed Edwardian building on Rosemount Viaduct was designed by architect Frank Matcham, who also designed the nearby Tivoli, the Blackpool Grand, the Hackney Empire in London and the King's in Glasgow. Each was specially designed so that actors could easily project their voices to the audiences using natural acoustics and sightlines of the building. 1906 Restaurant was named after the year His Majesty�s Theatre opened. Their 3 course pre-theatre meal is a must. 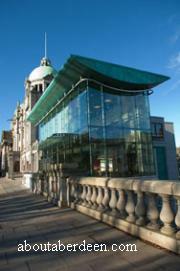 A major refurbishment which cost �7.8 million was undertaken in 2004 - 2005. The Architects were City Council principal architect Trevor Smith and Stuart Pattulo. The building contractors were Robertson Construction Eastern. The funding for the new wing was a combination of �4.8 million funds from the City Council, a Scottish Arts Council Lottery grant of �2 million, a Scottish Enterprise Grampian grant of �375,000 with the remaining money raised from the their own Tomorrow fund-raising and sponsorship campaign. Productions and performances were temporarily moved to Hilton. It re-opened on the 2nd September 2005 with additional features such as a new coffee shop and restaurant, new foyer and box office. Previous refurbishments took place in 1933 and 1982. 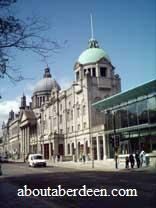 Original features such as the Dress Circle, The Gods, Balcony and Upper Circle were retained. These days over 250,000 enjoy the shows. It stands alongside the Public Library and St Mark's Church and is known locally with its neighbours as Education, Salvation and Damnation. In olden days when there was Railway Station at Schoolhill there was the addition of Transportation. Archivist and former Artistic Director Edi Swan published his book One Hundred Years of Glorious Damnation. It was aptly published by Black and White Publishing in the Centenary year and looks back at the last one hundred years of His Majesty's Theatre in Aberdeen. It is beautifully illustrated and has some stunning photographs of it through the decades. Mr Swan guides the reader through the history, including the original design by Frank Matcham and brings readers up to date with information about the 2005 extension. There is laughs aplenty and light hearted relief with many amusing anecdotes and stories about the managers, production staff and sound effect machines who have helped make it the success it is today. Such anecdotes also includes tales about the actors and theatrical performers who have walked the stage with the funniest tale being that involving Andy Stewart and a painting of Bonnie Prince Charlie! This comprehensive and enjoyable book should not be missed. The modern extension of glass and granite was the joint winner in the Major Project category in the Civic Building of the Year competition at SCALA�s annual conference in Hull in 2008. The architects Trevor Smith and Stuart Pattulo attended the event to receive the prize. It was awarded an engraved glass plaque which was be mounting on the building. The other winner in the category was Norwich Bus Station. The extension glass facade was made from a 250m2 double-glazed Pilkington Planar system which makes use of a frameless glazing system. This enables the environment temperature to be seasonally controlled so that the inside of the building does not over heat in the sunshine but still stays warm in the harshest of Aberdonian winter. He is thought to be a stagehand who was killed in 1942 by a stage hoist during a circus performance. His real name was John Murray though he was nicknamed Jake and he met a horrific death by decapitation by a spinning winch handle when he leaned over to apply a brake to a stage hoist. Though Graeme Milne in his book The Haunted North: Paranormal Tales from Aberdeen and the North East reports that the death certificate of John Murray read "compound fracture of the skull and destruction of the brain". He is a mischievous but kindly spirit who moves things about and many stagehands have had their tools such as screwdrivers moved about and hidden. He roams the long, ill lit passage called Lambeth Walk that goes from the balcony to the side of the building by St Mark's Church towards the fire escapes. This area is from the Balcony through the Fly Floor and down to Church Lane (Donald's Way). It is always cold, although heated. Guard dogs have never walked down here, refusing to move with hackles raised against the presence of Jake the Ghost. A witness, Pete Thorpe a former manage, saw him on the bridge to the fly floor, he was dressed in a brown dustcoat and disappeared before his eyes. Edi Swan often worked late at night and on his own painting scenery. In his book he describes being played a trick by Jake the Ghost when he laid down his paintbrush only to go back to it and find it elsewhere. This happened several times until he had to shout to Jake to stop his mischief! Mr Swan had two accidents whilst alone at night and feels that Jake helped him to safety - but you�ll have to read his book to learn about these remarkable stories. Jake has made his presence felt when people alone hear footsteps. This last happened during the 2005 refurbishment when project manager David Steele of the Robertson Construction Group and some carpet layers heard footsteps coming from the fly floor above the stage. No-one else was there�at least no-one alive! A Grey Lady ghost has often been seen to move across the foyer. No-one has been able to trace who she is or why she haunts the building. Some performers have seen the ghost of Miss Mitchell, a barmaid, in the Stalls Bar. A gentleman dressed in a top hat has been seen in the Royal Box enclosure and has been witnessed walking onto the stage during performances. Parking for His Majesty's Theatre HMT Aberdeen, after 6pm, can be found behind at Denburn Multi Storey Car Park in Spa Street. The postcode for your sat nav is AB25 1GL. el: (01224) 337642. Tickets can be booked in person, by telephone or on the internet at the Aberdeen Box Office. The Patron is Prince Edward. More haunted buildings of Aberdeenshire.